Around 3 weeks back, newly crowned Delhi chief minister Arvind Kejriwal made one of his first announcements after coming to power – The banning of FDI in multi-brand retail. In that article, we had mentioned that it is a very bad precedence that has been set in motion by Delhi Government. Now, all other states who do not agree with multi-brand retail FDI were free to overturn the decisions in their states as well. 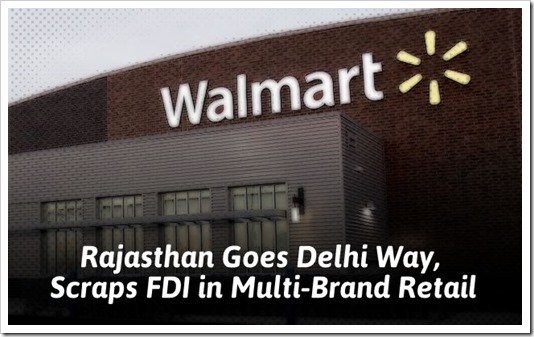 Rajasthan has become the second state after Delhi to ban FDi in multi-brand retail in their state. Rajasthan was among the 12 states that had previously agreed to it, but now have retracted in that regards. Rajasthan chief minister Vasundhara Raje has sent the letter to Industry minister Anand Sharma in this regards, reports Livemint. It was also confirmed by Rajasthan state official. In Rajasthan CM’s favour, it could be said that FDI decision was agreed by them when Congress was in power. But Congress met with heavy defeat at the hands of Bharatiya Janata Party in recently held state elections. However, what this means is, any policies that have been passed by previous Government are likely to be overturned by ruling party if they don’t like. Historically, it is very rare for the new Government to overturn decisions taken by previous Government. Now, with Delhi and Rajasthan both scrapping FDI in multi-brand retail, the companies who were looking to bring FDI for Multi-brand will obviously put their plans on hold, if not completely cancel them. In our view FDI in every sector is welcome, unless it has to do with National security and Defense. FDI not only creates jobs and increases employment, but also ensures that local vendors and manufacturers get more efficient to fight multi-nationals. Not only that, consumers are the biggest benefactor because product prices get more competitive! While Congress did have policy paralysis for the longest time, in recent months they have aggressively pushed FDI. With general elections looming large, and in all likely BJP set in coming back to power, the future of FDI really looks bleak! Effects of Multi-Brand Retail FDI on Businesses – Good or Bad? Why Walmart may fail in India? Fineprint of FDI in multi-brand Retail Sector!